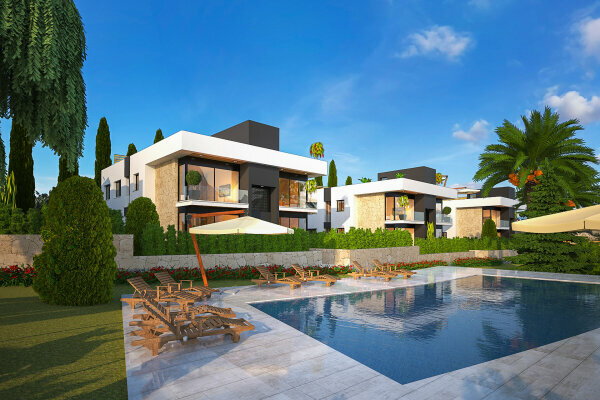 A new residence with Turkish title deeds in Bellapais, an exclusive area of Kyrenia. This project with a total of 16 residences consists of 4 blocks of 4 apartments each. Each two-bedroom penthouse has 91 m2 closed area, 6,3 m2 balcony and spacious roof terrace with 68 m2 area. From this roof terrace you can enjoy with amazing panoramic views to the Mediterranean sea and mountains. spacious green zone and big communal swimming pool. of the complex provides easy access to the entire infrastructure of the area within a walking distance, as well as proximity to the center of Kyrenia. with its 68 sq.m area will easily fit in everything necessary for a comfortable outside stay at any time of day and night.